The Sangean HDR-18 is a table top radio capable of digital HD Radio™ AM and FM reception. HD Radio™ technology will produce fidelity you have never heard on AM or FM before, and provide you with additional HD-only radio programming. Bass, treble and loudness may be adjusted. * Digital HD Radio™ reception. * Auxiliary Input for playing iPod™ or MP3 player (3.5 mm stereo). * Line Output on rear panel. * Telescopic FM whip antenna and AM loop antenna. * Informative backlit LCD display for: Channel Frequency, Call Sign, Radio Text, Audio Mode, Service Mode, Signal Quality and Clock Time. * Auto tuning list for program service (TBC). * Acoustically tuned wood cabinet. * Real time clock with Alarm and Sleep function. * Nap and snooze functions. * Full function infrared remote control. 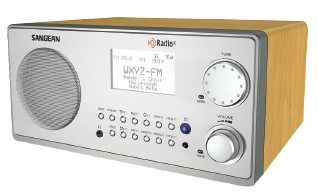 Other features include: backlit LCD, wake to buzzer or radio, 10 presets for AM and 10 for FM. With AM and FM antenna jacks. Includes infrared RC-P27 remote control, two AAA batteries for remote and AC power adapter. 9.4 x 4.5 x 7.2 inches 5.7 lbs. Please also see the Sangean HDT-20 tuner.